Hamilton's Serbian Orthodox community is celebrating two newly-named saints who have connections with this city's St. Nicholas church. Saint Marderije and Saint Sebastian — both missionaries who worked across North America — were named by the Holy Assembly of Hierarchs of the Serbian Orthodox Church in May. Marderije was canonized last month in Los Angeles and Sebastian will be in the spring in the Chicago area. Saint Sebastian, born Jovan (John) Dabovich in San Francisco in 1863, was parish priest at St. Nicholas from 1922 to 1923. At that time the church was on Beach Road. Saint Marderije, born Ivan Uskokovic in Podgoritsa, Montenegro in 1889, consecrated that Beach Road church in 1917 and became bishop for the region in 1926. "It's neat ... they walked the streets of Hamilton," said St. Nicholas board president Rajko (Ray) Djurdjevic, standing in the Barton Street East church surrounded by a fresco of icons depicting the lives of saints. He and his wife attended the glorification service in Los Angeles last month. To commemorate and educate the community about the lives of these two new saints the St. Nicholas church community has helped publish two new children's books chronicling their lives. 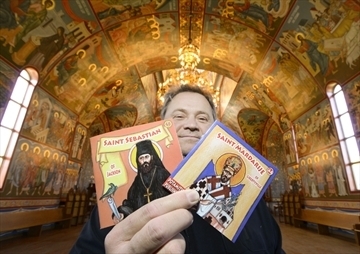 Jovan Djurdjevic, who manages the church's book store, said he was speaking about the new saints with a small publisher, Potamitis Publishing, from Greece when it was suggested they make two new books about the lives of these saints for their children's series. Many members of the Hamilton church community ended up being involved in everything from research, to editing, to translation, he said. The small, brightly-coloured books (in both English and Serbian), just arrived from Greece and will be on display for sale at the services this weekend. Other churches in Hamilton and the United States have expressed interest in the books as well. Saint Sebastian's book chronicles his life starting as a sharp-minded boy in San Francisco, to his work teaching in his local church, to missionary travels to everywhere from Japan to Alaska. He studied at the Theological Academy of Saint Petersburg in Russia and became a monk in 1887. He served in North America, including as a parish priest in Chicago and died in Serbia in 1940. Saint Marderije's book starts in a village in Montenegro, where he was born and grew to be a calm and book-loving child. He studied at Studenica, Serbia's largest monastery, where he took the monastic vows. He also studied theology at the Theological Academy of Saint Petersburg, where during his free time he cared for prisoners of war. He was sent to the diocese in North America. Marderije then worked as the abbot of a monastery in Belgrade, before going back to America and building a monastery in Libertyville, Illinois and becoming the first North American bishop of the Serbian Orthodox Church. In the Orthodox church saints are thought to be descendents of Christ's apostles, said Jovan Djurdjevic. Almost more important than Sebastian and Marderije's historical connection to Hamilton is the blessings the community believes they can bring to Hamilton, he said. "We believe that saints have a special place before the throne of God ... and we believe that presently and going forward, these two new saints can help us even more than they did in the past," he said, adding that by honouring them, the community hopes to attract their blessings. St. Nicholas is the oldest Serbian Orthodox parish in Eastern Canada. It was founded in 1913 in a house on Sherman Avenue North, before moving to the Beach Road site and then its current home at 1415 Barton St. E. in 1957.